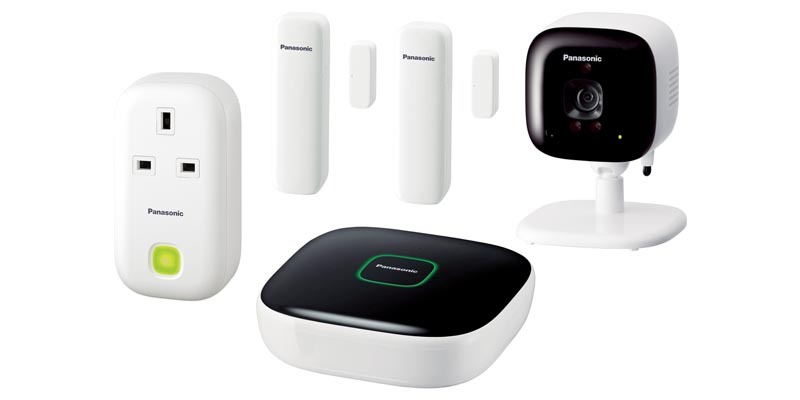 The Panasonic Smart Home Monitoring & Control Kit offers peace of mind and home security, as part of Panasonic’s Smart Home range. This kit offers wireless monitoring of your home by connecting to all your Smart Home devices. In addition to communicating with other devices, this system can also record footage from the camera onto a microSD card. The supplied Smart Plug works as an adapter between your smart appliance and the mains plug socket, this offers complete control of all devices via your smartphone wherever you may be. This remote security system includes a window/door sensor which is easy to install and is triggered whenever the window or door is opened, at which point you will receive an automatic instant alert to your smartphone. At the same time, the compact indoor camera keeps can streaming live video and audio footage directly to your smartphone, even at night thanks to infra-red night vision and a built-in microphone (this camera can also be used as an effective baby monitor). The monitoring and control iit connects the devices wirelessly using standard DECT wireless as a more secure alternative to the normal 2.4Ghz WiFi band. DECT offers a interference free range that’s invisible to other wi-fi consumer products in the home. The kit is easy to set-up and has a 300 metre connection range with no monthly fees, it includes everything you need to get your smart home started and secured including the hub/base, two door/window sensors, the camera, and the smart plug. All are simple to connect via one-touch pairing so you can have everything set up in no time at all, even if you are not particularly tech savvy! The kit is compact and weighs just 983g, plus everything is covered by a Panasonic 1 year guarantee.